Please note that the links on this page will take you to Web pages outside of the Kaminsky, Sullenberger & Associates website. Kaminsky, Sullenberger & Associates, Inc. is not affiliated with these organization nor maintains the information contained within these sites and therefore shall not be liable for any errors, inaccuracies, omissions, or untimeliness. Includes managing Observations, Field Training Tasks, and any addition Training required. For further information please visit us at www.departmentware.com or call 469-759-9489. Each and every day we are faced with scores of choices that, in subtle yet discernible ways, can either enrich or impoverish our personal character. 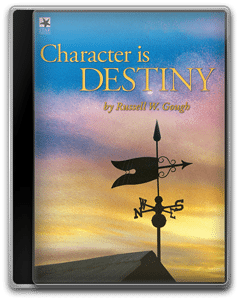 Character Is Destiny, a sort of self-help guide for the soul, shows how we can lead richer lives simply by being better people. Character Is Destiny, hosted by national ethics expert and Professor of Philosophy Russell Gough, illustrates the importance of doing the right thing every time. Coupon Code: Use coupon code KSA-30 when ordering this DVD or any other product offered by Star Thrower. Want to be added to our links page? Please contact us via our web form or call 303-358-9780.